"A hip little place to come for wealthy people." 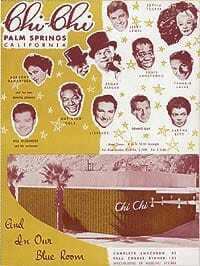 In the 1940s and ’50s, the Chi Chi was “a hip little place to come for wealthy people,” Bill Alexander says. Alexander played the Starlite Room, so named for the dome with twinkling lights above the circular stage. He started in 1947 at the age of 20, fresh from the Army. From 1950 until the club closed in 1965, he held sway seven nights a week, 10 months of the year. From Labor Day until the Fourth of July, the Starlite Room hosted those in the movie industry — from actors to directors and producers to studio heads such as Jack Warner and Cecil B. DeMille, a lot of real estate professionals entertaining clients, and wealthy Los Angeles businessmen. Shows started at 9 p.m. and midnight. “I used to stall the shows for 15 or 20 minutes if we had a big crowd,” Alexander says. “That way, they would drink more for the boss.” He would have the band warm up or he would go to the maitre d’ station and pick up the phone. So long as the audience saw something happening, they were content to wait. “The boss” was Irwin Schulman, whom Alexander calls “a very gracious guy” with a lot of friends and connections, including Howard Hughes, a frequent Chi Chi guest. A paranoid hypochondriac who rented three homes in Palm Springs, Hughes would call Schulman before coming to town and ask him to have Mary, a Chi Chi employee, disinfect one of the houses. When Hughes came to the Chi Chi with lovely young starlets, “the boss” ordered the band to play until he left. While they normally quit at 1:30 a.m., Alexander says, they would have to play another hour or more while Hughes seduced his female companion in a back booth. The Chi Chi also attracted notable Mafioso, such as Sam Giancana and Mickey Cohen. Two plainclothes cops came in at least three times a night, and “the help” would inform them of hoods who had been in or “anything suspicious,” Alexander says. In the summer, a cop might come to the Chi Chi in uniform. “He would sit at the bar have a drink. Nobody thought anything about it,” Alexander says. Alexander recalls when the Chi Chi closed. “We hired the Milton Berle Revue for nine days for $45,000. I had a 25-piece orchestra, which cost around $8,000,” he says, noting that Berle “packed the joint.” But after the show, Schulman summoned Alexander to his office. “He said, ‘Bill, I am going to have to close the joint. You saw what we did. I really didn’t make any money. I took a helluva chance. What if they hadn’t stormed the gates to see Berle? I would have lost a fortune.’” During the last few years of the Chi Chi, Schulman built the Riviera hotel, and that’s where his friends visited him after the club closed.